Foxpro's 155 Mark II files generally are superior quality live animal recordings marked with the .24b extension. Loops were medium length and averaged 52 seconds for the set. These sounds are available only in a proprietary format on the newer Foxpro callers. The sounds are meant to be played constantly. They contain no pauses and cannot be edited by purchaser. A few had pauses where it was possible to mute at a zero crossing and were marked "FPSR." The Foxpro 24b sound list included 15 highly rated rabbits, 20 highly rated birds, at least 6 high quality coaxers. Additionally, 4 fawns, 2 foxes, 2 goats, 3 squirrels and 1 kitten were rated excellent. 85 sounds were rated 3 star or better. Some of the best rabbits include Adult Cottontail, Dying Jack, Eastern Cottontail, Lightning Jack, Lil' Jack, Snowshoe High-Pitched, and Waning Jack. Outstanding bird recordings include Blue Jay Dist, Dist Sparrows, Dist Starlings, Red Bel Wdpckr 1, Red Bel Wdpckr 2, Wacky Wdpckr, Wail-N-Wdpkr, Woodpecker, and Worried Wdpckr. 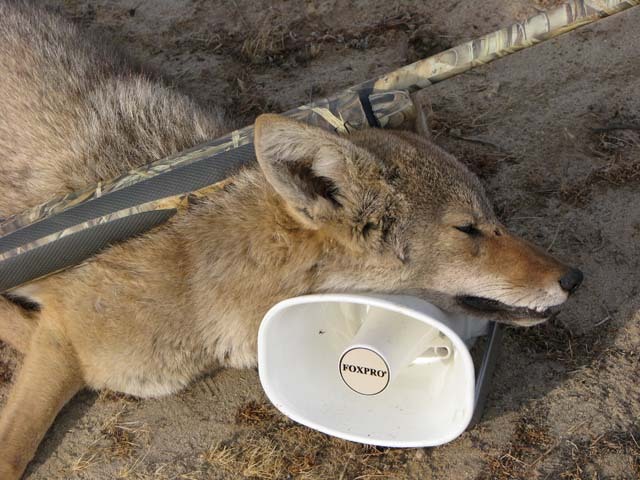 Foxpro continues to add to their collection of outstanding live coyote sounds. Check out Coy Fem Whimpers.